The images are pretty self explanatory but here are the steps. Trace a circle using a cup. 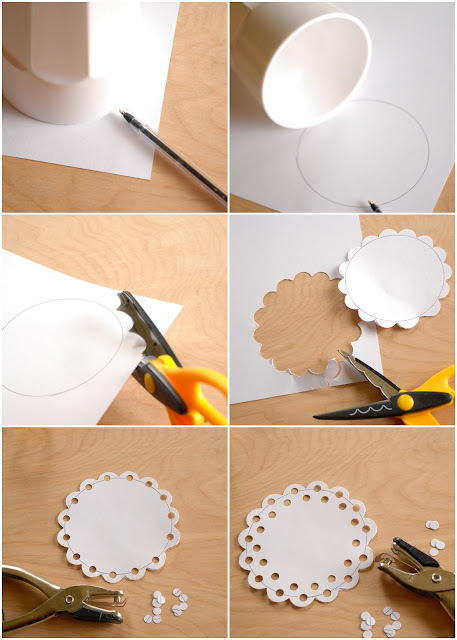 Use large scalloped scissors to cut around the circle. Use a hole punch to punch a hole in each scallop. Punch another row above and in between the other holes. Erase circle or flip it over. You can use this same technique in a straight line to make a lace strip like I did for the package on the left. 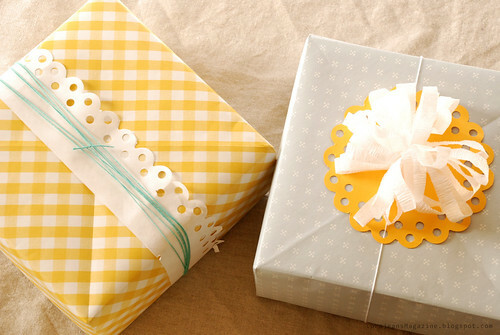 Such a pretty way to add something special to a package. oh this is so fun and cute. I'm definitely doing this. btw, sorry for all the comments. I love your blog. It's going in my reader. how did i just now find you?? what a nice idea. I´ll feature on my blog. Hope you don´t mind. I just discovered your blog and I love it. I want to try to make the box from wall paper. I never knew what to do with left over wall paper, now I know. Thanks for the video. Hi there! I love this idea...it's so darling...and I was hoping that you might add it to my Easter and Spring Linking Party to share with my readers. If you are interested, you can go here http://bakedbyjoanna.blogspot.com/2011/04/easter-linking-party.html to enter. Thanks! This is so simple and easy to do and looks so lovely! Thank you for sharing this technique! A few day ago I found your blog. I think your ideas are amazing! Every day I'm looking forward to some more!! Hugs from Poland! Just wanted to say that I just linked over via Pinterest, and I am in love!! Love your site . Love also the quilt cards. Keep up the good work and the tutorial on making your own doily is wonderful. Just a thought hon! You could also use other kinds of stamps to make the each different like a flower stamp or Diamond star oh the possibilities are endless thank you for the ideas!! !